Isabel is an attorney, accomplished rider, and now we know she's an all round smart chick, introducing the concept of helmets in competition in the international arena. Good for her! She looks great, and how cheeky of her to pick the color gold! I'm not sure that would have been my selection, but she has the panache to pull it off. Is dressage going the way of Nascar, do you think? Good for her. Ever since I read of the woman earlier this week who died from head trauma caused while clipping a horse I've been considering wearing my helmet full time while at the barn. On the other hand, who wears a helmet while feeding? Where does common sense end and paranoia begin? I think calling attention to her helmet is an excellent thing to do. Ms. Martyr, I was participating in an online discussion about the safety of riding during pregnancy, and someone found a study on horse-related accidents during pregnancy. According to what the researchers were able to find (which doesn't necessarily reflect every instance, just ones reported), there were no recorded instances of miscarriage due to a fall from a horse but several recorded instances of miscarriage due to being kicked while handling a horse on the ground. The study concluded that although there was no specific danger to riding during pregnancy, GROOMING during pregnancy was extremely dangerous! I know that personally I've had three concussions from falls (was wearing a helmet, but during pre-chin-strap days, so it did no good) and no serious injuries from being kicked. Obviously being kicked can kill. But it also seems to me that until helmets have face guards, they won't protect the part of the head most likely to be kicked. And a good horseman usually has some warning due to ears. Really, you just can't be too aware that you're working with a large, unpredictable animal. Do we assume it's gold for the Festive Season? Either way, if it gets the conversation started, it may save lives. Isabel is an example to all of us. So many dressage riders seem to think they are immune to accidents. I know all too well how wrong that is as I almost lost one of my best friends to a head injury--her helmet saved her life. FEI riders need to set the example for the lower levels to follow. Once the fashion image changes, safety helmets will become the standard at all levels. If we're going to wear a helmet at all times around our horses, what if the horse kicks us in the face? Or in the chest and causes a heart attack? This happened recently with a lady that that blogs. Allie, I find that study interesting since I fell (or rather my slipped and fell and we both fell together) when I was six months pregnant. I had ridden without incident with my first pregnancy so continued with my second on my safer, older horse. I was so worried something had happened with my baby but all was fine and now he's riding horses himself. Of course I stopped riding for the rest of my pregnancy! There are times I feel like I ought to have my helmet on my night table so I can put it on before I get out of bed--whether I'm going to be working with the horse or not. Seriously, helmets are ALWAYS a good idea. I hate seeing kids doing the gymkhana thing wearing baseball caps or straw cowboy hats. I realize it's not COOL to wear a helmet if you're a cowboy, but head trauma is head trauma. It doesn't differentiate between disciplines. I'm not crazy about the choice of color, but kudos to Isabell for setting the right example. 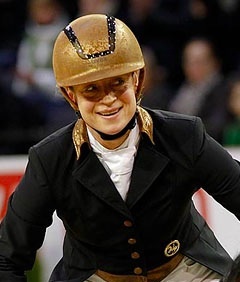 I hope one day helmets will be the norm for all dressage riders. I wear a helmet on the ground during the peak of hunting season. Even the most bombproof horses still have the instinct to flee predators running through or out of the woods. Or, at the very least, they startle and do uncharacteristic things. A close-by gunshot while you're fiddling with the leg straps on a blanket could result in a leg to the head as the horse reacts. Never know. I like my brain where it is. I never understood why people assumed riding a horse on the flat meant they were completely immune from head injuries. Some of the worst injuries I sustained occurred as I was riding on the flat. And, WHY IN TARNATION most of those western gamers/rodeo riders don't, at the very LEAST, wear helmets is beyond me! I think wearing a helmet while riding is a great idea, it's a long way down from the saddle. I think the other thing which could improve safety but which is often overlooked is the way we keep our horses. Life in a herd, a few acres to run with them in, and a hay or natural grass based diet seem to meet their psychological needs better and have them happier and calmer than horses kept in stables or small outside yards. Horses also generally seem much more relaxed if ridden in gentle bitless bridles (ie, cross unders and side pulls).